Size: Women’s medium. For larger sizes, CO 10 st additional for each size up. I made this wrap at the behest of my mom, who wanted a loophole to get her through her office’s dress code, allowing her to wear tanks and camisoles in the summer. The point of this wrap isn’t to keep warm, or even really to cover up, but to give the appearance of being covered up, something like cutting the feet off your tights in high school and calling them leggings to get away with wearing your alarmingly short skirt. It knits up fast and easy, thanks to the big needles and elongated stitches. 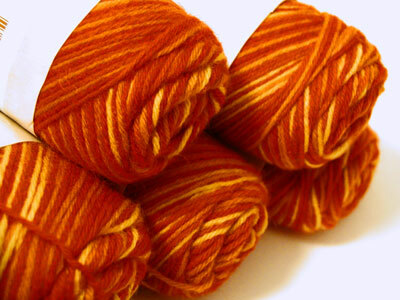 Gauge isn’t super-cricital–use any 3 worsted weight yarns. 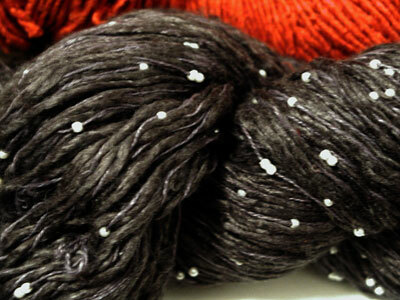 Kristi’s a magpie, so the multi-yarn version is full of bling. The elongated stitches in this version are worked by wrapping extra YO on the right needle before knitting each stitch in the row. 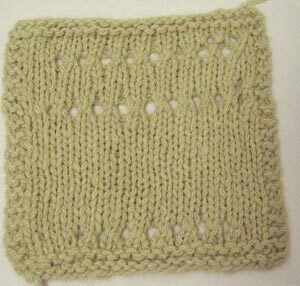 The following row is knitted with the same number of stitches, dropping the extra yarn-overs from the previous row. This method varies from the elongated stitches in the mohair version, but the end result is almost identical. The multi-yarn version uses about 60 yds of each yarn, so it’ll work for scraps. If you run out, just bind off sooner, preferably immediately after a drop-stitch row, so it won’t curl. 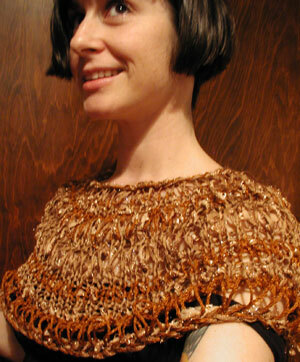 The single-yarn version has a wider neckline (BO a few rows sooner–also handy if you run out of yarn. Tip: If you’re using interchangable circulars, use a smaller needle for your left needle once you start dropping the elongated stitches. The stitches will slide across easier, so you don’t have to fight with them. ~60 yds each three coordinating/contrasting yarns. C can be an effect yarn. Multi yarn version (single-yarn version). If only one instruction is given, work both patterns the same. 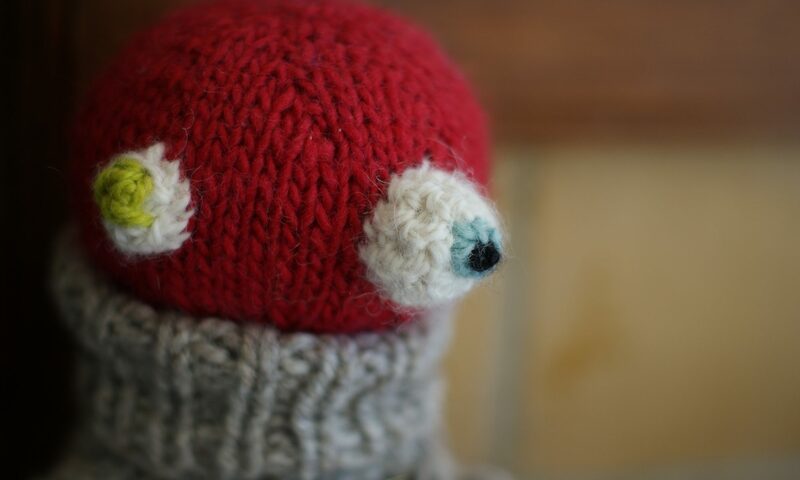 In the case of the single-yarn version, follow the same instructions using 1 strand. Using all 3 yarns (using 2 strands), CO 80. Join & PM. Row 1: Yarn A: K, wrapping yarn 3x on each stitch. Finish neckline by threading with Lily Chin’s brilliant method. Thread the tail end onto a yarn needle. Then insert under the first bound-off chain after that big ugly gap. Go under both loops of that chain, like you would if you were picking up stitches into it, then pull the thread through and insert the needle back into lthe middle of the last bound-off chain (where you originally pulled out the tail). Pull taut to even out, then weave in end into the top edge. Grasp by the top & shake vigorously to pull taut the dropped stiches. For slippy yarns, that will be enough. For less slippy yarns: grasping the the neckline and hemline, tug gently to pull the elongated stitches taut, working around the entire wrap twice. If you cast on with the long-tail method, pull the hemline taut width-wise as well. I disapprove of the fringe, hence hiding my face in shame, but I know my mom will dig it, and the whole point of making handknits for other people is to give them what they’ll actually like, not to impose your own values on them, right? 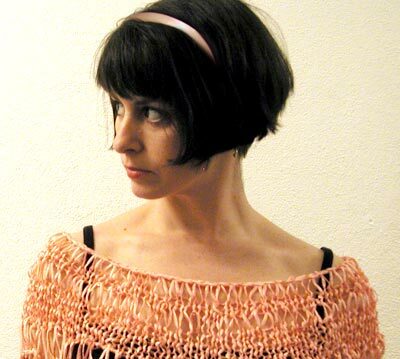 So if you want fringe, cut five 12″ strands for each tassle. Place a tassle every 5 – 7 st around hemline, leaving spot for the center tassle. Cut six 2′ strands, hold with ribbon and make final tassle. I wish I had a nicer dress form or a mannequin. I’m getting too old to look cute in pictures I take of myself. Sigh. See what you’ve done to me? I like cables now. When I started knitting, I hated cables. And philosphically, I still do. I would never buy a cabled sweater, for instance. But they’re just so fun to knit. P.S. By the way, here’s your pants. Except that there’s a few things I still want to buy before the Webs anniversary sale is over. Like some of that Baby Alpaca Grande. And I should swatch the stuff I already bought in case I can’t live without it. Hm. I am clearly not ready for the spirit of the stashalong. 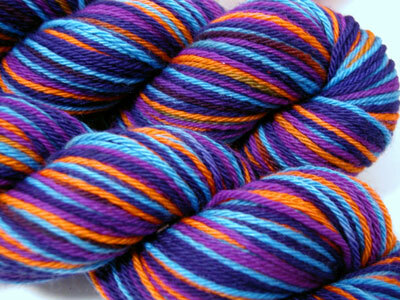 Okay, I don’t think I actually made some big pronouncement last time I fell of the yarn wagon (mmmmm, yarn wagon…. ), but I should be laying off. Sort of like I’m not officially on a diet, but I shouldn’t have finished off that jar of Kisses last night. Anyhoo, the stuff I bought is for an actual pattern that I’m actually going to make (next month–too much unfinished stuff right now), a very cute top. And the pattern came free with the yarn and the yarn was cheap, so what do you want from me? The top is here and the yarn ($1.98/ball Schoeller StahlÂ Micro Cable, which unaccountably has an accent over the final e? 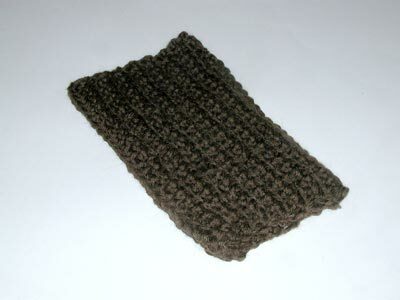 )it usesÂ is smooth and shiny and nice to knit. 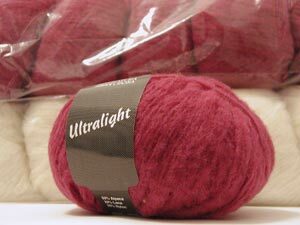 Then to round up to $25 because I feel compelled to use one of my $2.50 off $25 credits (which I realize is their ploy, but I buy it anyway), I bought 2 balls of Cleckheaton Merino SupremeÂ at $3.50/ea. It’s buttery yum and has an almost cottony touchÂ that looks prone to pill (like the Debbie Bliss Cashmerino), I’m thinking mittens? I love the acidy pea color, but it looks crap on me. But down on my mitts, who will notice? Swarves. Or scatches? Scwatches? Sqatches? Sasquatches? Wait, what? So I’ve been swatching yarn trying to pick the very bestest so I can start crocheting my big project for Vickie Howell’s book, but I decided to just go ahead and use the whole ball so I can get a better sense of drape and yardage. I still haven’t found a yarn/color combination I’m happy with. 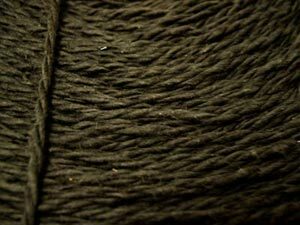 The Berroco Ultra Alpaca (50/50 alpaca wool, in very rich multihued heathery color blend) had nice yardage & the alpaca gives it great drape, but the color’s just too green (at least unfelted). 1 hank made a 40 x 7″ scarf in sc. 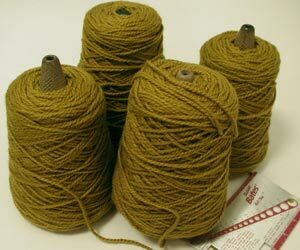 The Tahki Donegal Tweed (100% wool) is closer to the color I’m looking for (dark khaki green/brown), but maybe too tweedy? And it doesn’t have the drape of the alpaca blend, but there’s good yardage here, too. 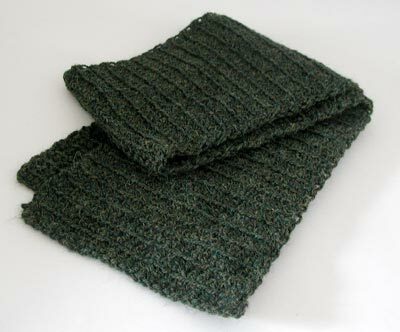 One hank made a 45 x 6.5″ scarf in sc. The perfect color (it’s a little khakier than it looks here) was the Peruvian Collection Baby Silk (80% baby alpaca/20% silk), but the yardage is awful (although, everything’s relative–for the price, it’s pretty comparable) because it’s a “luxury yarn” & comes in tiny 25g balls, and it’s just too fine for my purposes, so I had to double it, which resulted in a tiny 7 x 9″ swatch from a whole ball. I seamed the side & I’ll be using it for a beer cozy, unless it’s so dreamy felted that I’m beside myself and decide to use it after all. But it’s already seamed, so it will still be a beer cozy. The next step is to felt them, but I was curious about their washed properties for future reference, so I gave them a little bath before their felting. I don’t know whether the donegal got shorter or the ultra alpaca got longer because I’m waiting until they’re dry to measure, but they’re the same length now. The baby silk definitely is larger row-wise. I didn’t try to block them back to their original dimensions, just patted them out to see what they do naturally (below: donegal, ultra, baby). My Webs order came yesterday. I immediately photographed it & put it all away before Ron got home. I’m officially an ashamed addict who has to hide her habit. It’s horrible. 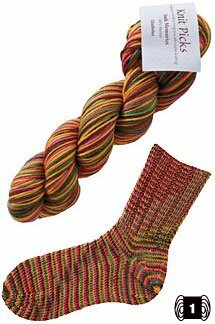 And seriously, I can’t stop thinking about Webs grab bags and how much I want some, even though I’m totally too busy to knit just now, and even though I have a lifetime of yarn in my stash. BUT I CAN NOT RESIST A BARGAIN. This is my downfall. 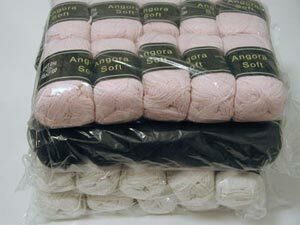 Â 1) 4Â bags K1C2 Angora Soft, 2 to knit into plush, light sweaters (black & pink), 2 to dye (white). 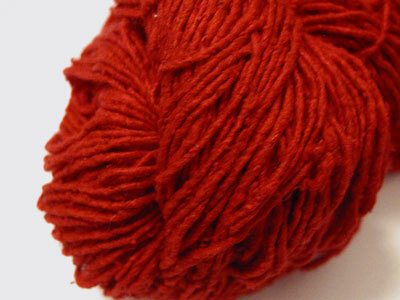 I got a bag of this in pale green in my last Webs order grab bag & wasn’t overly impressed until I swatched it. It was very nice to knit. 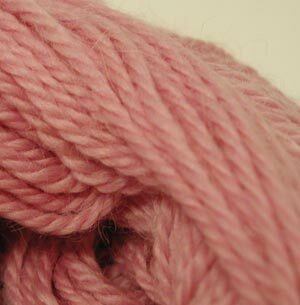 It’s a soft chain yarn with nylon, viscose & angora, soft & drapey. $22.49/bag of 10 after discount. 2) a big cone of black cotton, for a rug, probably, or something housey. $3/pound. This was 6#. 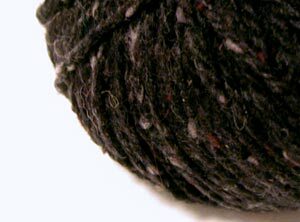 4) Worsted mill end yarn $5/# (about 2.6#). Who knows? It’s soft enough. 5) Acidy green rug wool, $4.50/pound (~2#). For an acidy green throw rug! 6) 2 bags of Ultralight ($30/bag of 10). 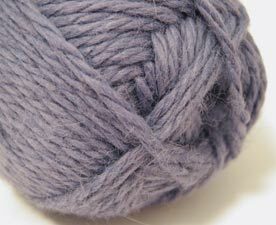 53% alpaca, 22% wool, 25% nylon. Lofty and fuzzy! One bag in a hot pink for a tight ribbed sweater, one in white for dying. The color’s a little more retina-burning. Reynolds Andean Alpaca Regal (90% alpaca, 10% wool) on sale for $6.75/100g, which I was hoping would be a good substitute for the Plymouth Baby Alpaca Grande, also on sale, but a bit more expensive–the Alpaca Regal seems less bulky, but it might just be that the skein is more tightly wound. Plymouth Suri Merino. I don’t remember choosing this–I guess I just wanted to sample it? 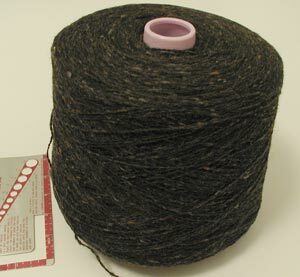 Jo Sharp Silk Road Tweed in licorice, on sale for $6/ball–the solid got props from Knitter’s Review, and it feels super dreamy. 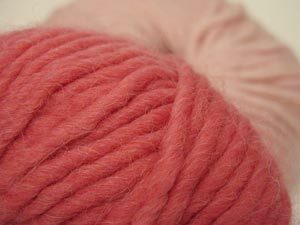 And that last one isÂ Valley Yarns Sugarloaf, a merino/microfiber blend that reminds me of Lion Kool Wool, only lighter, but that didn’t bowl me over. Of course, it does look nice and lofty, and should have dreamy stitch definition. 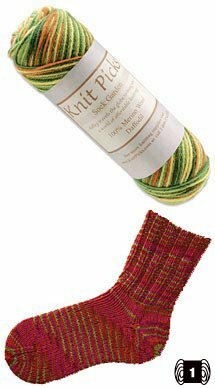 I’m fond of Kool Wool, but it’s been discontinued & so it’s easy to find for cheap right now (Smiley’s has it for $2/ball–I bought a ton of it when they had it on special for $1.25). I haven’t knit it yet, so we’ll see. I also ordered a cone of alpaca/lambswool blend on closeout, but they sold out, fuckers. It looked yummy & I was psyched about making a sweater from a cone, a sweater that might not need a shirt under it. 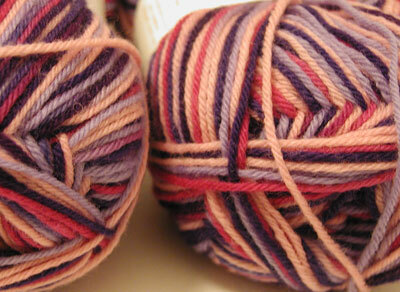 Cone yarns, atÂ least the ones on closeout,Â are usually so scratchy. 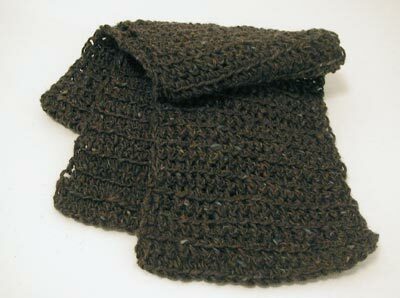 It’s a short scarf, but it’s double-knit, so it’s double thick and double toasty. Just the right length to wrap once and tuck into your collar. 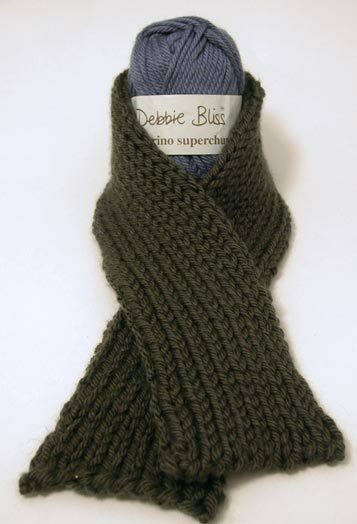 It’s knit of Debbie Bliss cashmerino superchunky, which is normally pricey. 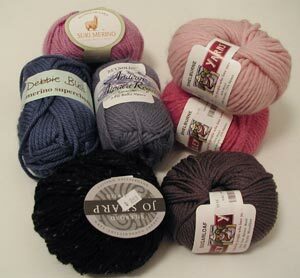 But Webs has 3 yummy closeout colors that are just $8 each. It’s a 100g ball, so it’s a very good value. 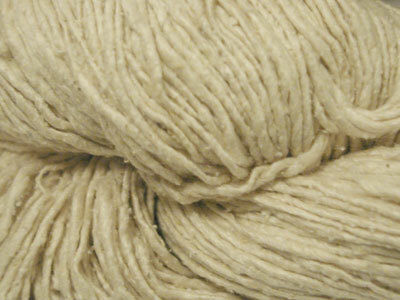 The yarn is delectable, butterysoft and lofty and yummilicious. I’ve heard it’s prone to pilling, so I was reluctant to buy a sweater’s worth, despite its skin appeal. 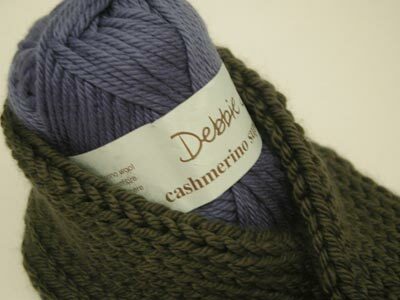 If you’ve never double-knit, this is an easy introduction. 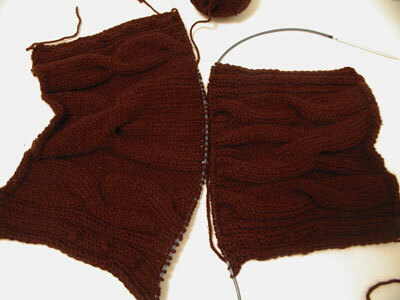 You’ll knit every other stitch and slip the alternate stitches with the yarn in front. In effect, what happens is that you’re knitting one side of doubled fabric at a time, using every other stitch in your working side (the yif slipped stitches keep the opposite side’s work out of the way untiel you flip it). You end up with a tube that’s seamed at the bottom, so the result is almost like knitting in the round. But it stays flat. I’m sure there’s a reason, but I don’t know it. Every row: *K1, move yarn to front, Sl 1, move yarn back. Continue until you’ve got about 18″ of yarn left, then split the stitches between 2 dpns, alternating every other stitch between the 2 needles. Seam the open end with kitchener stitch. (If you’re afraid of kitchener stitch, you can K2tog, *K2tog, BO across the whole row, but it’s a stiffer end. About a week ago, when I finally got paid, I went on a little bit of a yarn bender. It was kind of ugly, really. I could’ve bought another full mattress set with what I spent on yarn (which sounds like a stupid point of reference, except that we bought 14 beds this weekend). Anyway, I’ve already run through guilt, remorse, shame, self-recrimination & acceptance. 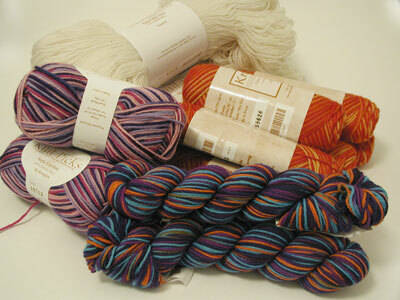 And then I got my yarn, hurrah! Well, I got some of it. The Webs stuff is still in transit. From KnitPicks. This shows the best color accuracy. 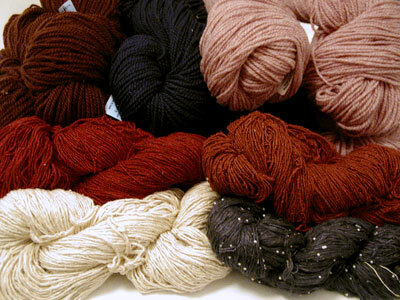 The hanks were pleasingly fat, and the yarn’s soft, classic yarn. Nothing mindblowing, but perfectly nice & suitable for next-to-the-skin use. 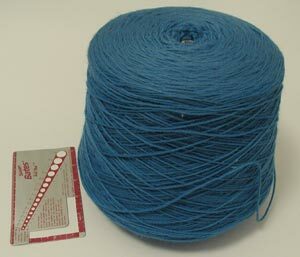 I might get a bunch of this for the workshop, for practice yarn. It’s $3.99/100g. So that’s knitpicks. But that’s not all! 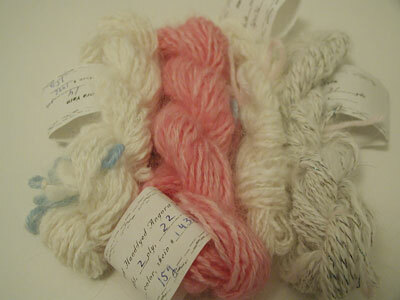 I got some teeny (really teeny, like 14-31yds each) little skeins of handspun pure angora on ebay. There should be enough to make someting tiny and striped. I don’t know what yet, maybe some little cuffs or a little fuzzy choker or headband. It’s nice because it’s pretty chunky (3 worsted, 1 sport) for angora, and there are a few lovely, alarming, irregularÂ tufts of fur in the mix. The last was also an ebay package. 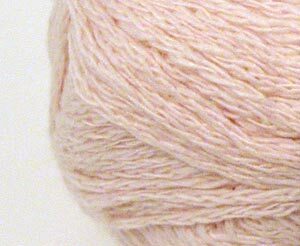 I originally went in for the Briggs & Little, this total grandma wool yarn that I really like.Â It’s kind of greasy/scratchy, but warms to your touch & becomes very pleasing to knit, then washes up all lofty & nice. It’s very no-nonsense & unfancy, which makes me unaccountably happy. 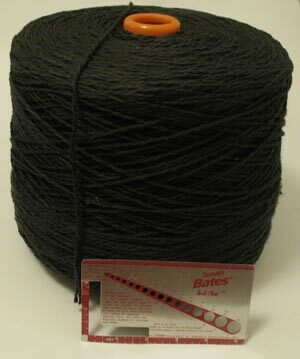 They’re also cheap and come in big, fat 4oz hanks. They were cheap ($1.99ea), & I bid one one before I realized she was in Canada & shipping would counteract the cheapness factor (which was stupid not to realize, because B&L is Canadian). So I thought it in my best interest to maximize my order. So I got 3 skeins each of the pink, brown & navy, then addedÂ 2 skeins of supersaturated colored silk ($6.75/100g), in true red (below) & brick. I am well pleased with the colors. Assuming it knits up like I hope, I’m expecting to make a summer tank of it, maybe red in front & brick in back, or red on top & brick on bottom? and then a hank of undyed silk, with a mind to dying it. 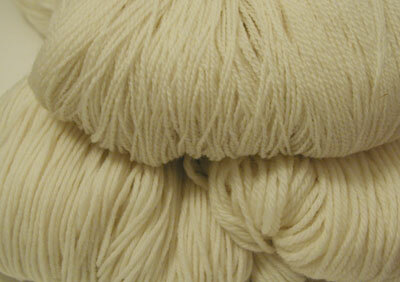 The undyed had a looser texture, sort ofÂ a silk version of Henry’s Attic Inca Cotton? Ron said it looked like rag mop, which itÂ does, but I still like it. It was $4.99/100g. Last is a silk/viscose blend strung with little tiny fake pearls. This is the only one I don’t know whether I like yet. It’s not as shiny as it looks here, and the little pearls are kind of cheesy. But it might knit up nice. Or if I could dye it and get it blacker, I think I’d be happy about it.